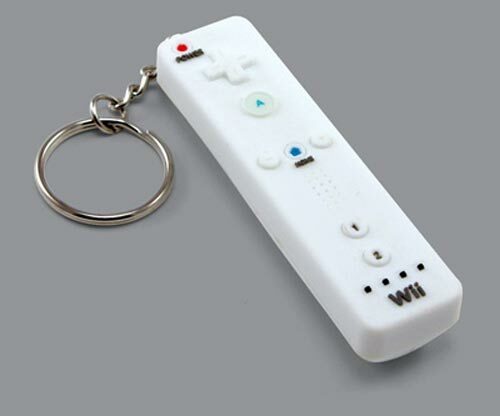 Check out this geeky accessory, the Wiimote Keychain. You can use this teeny controller to gain access to your house or car, or in some game play situations even turn on your car’s ignition. In certain scenarios, waving the remote in front of a grocery store clerk or a gas station pump provides discounts or initiates the fuelage mode. And occasionally it provides a series of numbers for secure access to computer systems. But beyond that, its functionality is pretty limited. It has no motion-sensing capabilities, and our attempts to plug it up to the mini-nunchuks or the hamster-sized WiiHelm accessory prototype proved fruitless. Okay. It’s a keychain. It doesn’t *do* anything but hold your keys and various accoutrements that belong on a keychain. But it has tiny Nintendo styling, which you gotta like. Made of PVC, it measures c. 3 inches long x 3/4 in. wide x 1/2 in. deep.